In order to safely and seamlessly integrate UAS into non-segregated airspace, a robust Detect and Avoid (DAA) capability needs to be established. The New York Griffiss International Airport Unmanned Aircraft Systems (UAS) Test Site is evaluating next- generation UAS ground-based detect and avoid (GBDAA) systems capable of enabling extended UAS beyond line-of-sight (BLOS) operations in airport terminal areas and in transition airspace. The Griffiss UAS Test Site range instrumentation system provides the foundation for future UAS detect-and-avoid testing in the National Airspace System (NAS). Griffiss has installed and activated a dedicated precision air traffic surveillance system based on wide area multilateration (WAM), ground-based primary 3-D Radar and automatic dependent surveillance-broadcast (ADS-B) provides high-definition air traffic surveillance (independent of legacy FAA air traffic control radar) for the Griffiss UAS test range. Installed in the UAS Operations Control Center is a state-of-the-art multimedia and air traffic data capture, display, storage, playback, analysis capability and operations support system. System capability includes synchronized multi-channel recording and playback of video, audio, and data, including accurate aircraft track and telemetry data. The purpose of Griffiss range instrumentation is capability development for measurement and recording of position, velocity and track information for airborne activity in and around Griffiss test ranges, and to support GBDAA development. The engineering design philosophy for Griffiss range instrumentation is for operation at a high Technology Readiness Level (TRL). This system is designed to be extensible, both in its ability to incorporate additional ground and airborne sensors, and to expand to cover additional airspace, from the surface to Class A airspace and above, over a 15,000 square mile lightly-populated area in Upstate New York. 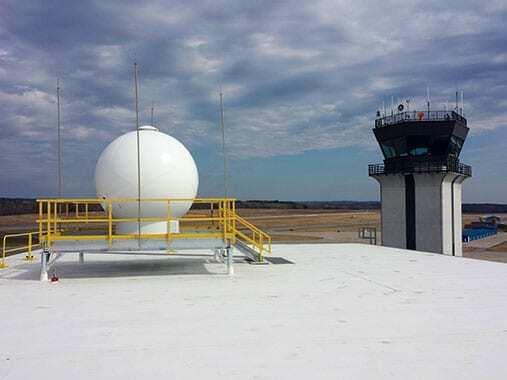 In late 2016 the FCC granted Griffiss a two-year FCC experimental license to transmit on 1030 MHz allowing the test range instrumentation system to track transponder-equipped air traffic. In 2017 Griffiss plans to acquire an SR-3 X-band surface movement radar and a Gryphons Sensors R-1400 tracking radar. Griffiss has a signed Interconnection Security Agreement (ISA) with NASA for Live, Virtual, Constructive-Distributed Environment (LVC-DE) air traffic surveillance data exchange. This intent of Griffiss is eventually to extend this capability to support exchange of live Griffiss surveillance data with the Federal Aviation Administration (FAA). The NUAIR Alliance is playing a leading role working with NASA, testing a system that would make it possible for unmanned aircraft to fly routine operations in United States airspace.